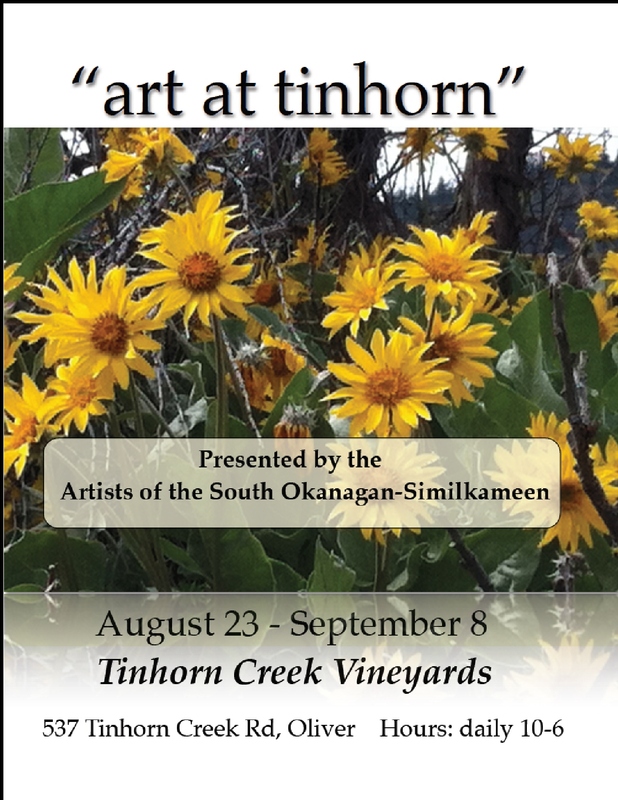 “Art at Tinhorn” – The Artists of the South Okanagan-Similkameen return to Tinhorn Creek Vineyards with their annual summer exhibition of fine art. August 23 to September 8, daily from 10-6. This popular annual summer show and sale features paintings by the Artists of the South Okanagan-Similkameen, all of whom belong to the Federation of Canadian Artists. You can expect to see paintings in a colourful array of media: oils and acrylics, watercolours, encaustics and mixed media. A visit to “Art at Tinhorn” makes a great outing, and it’s a good way to showcase for summer visitors our rich and lively world of art. So plan to spend some time with art. Visit Tinhorn Creek Vineyards, between August 23 and September 8. 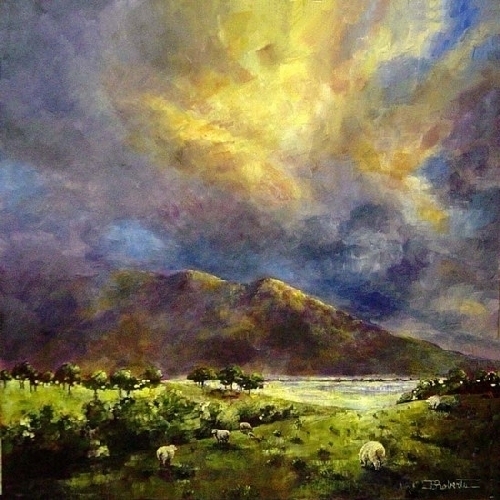 The Tinhorn gallery is open daily from 10:00 a.m. to 6:00 p.m.
oils and watercolours. So, plan to make a date with art! Come along — and bring some friends! — to the opening reception on Saturday June 15, from 11:00 a.m.
to 2:00 p.m. The show will continue until July 27. Picture This Gallery is located at 133 Westminster Avenue West. The gallery hours are Tuesdays through Fridays from 10:00 a.m. to 5:00 p.m., and Saturdays, 10:00 a.m. until 2:00 p.m. The exhibition is supported by the Penticton and District Community Arts Council. Make some time for some “Great Moments in Art”, supported by the Penticton and District Community Arts Council. For further information, contact Leir House at 250-492-7997. The South Okanagan – Similkamenn chapter of the FCA is a member of the Oliver Community Arts Council. “Spring Palette”, an exhibition of fine art, opens May 25 at Leir House in Penticton. In the show are paintings by artists from among the 95 members of the South Okanagan-Similkameen Chapter of the Federation of Canadian Artists. Each year the local Chapter presents several exhibitions of members’ work, with one or two shows each year adjudicated by the national organization. Work selected by the jury must meet the standards applied to paintings exhibited in any Federation venue, regional or national. “Spring Palette” is one of these juried shows. Accordingly, the art will reflect the high standards expected by the Federation of Canadian Artists. Works on view in “Spring Palette” include a variety of painting media — watercolours, oils, acrylics and encaustic. The Arts Councils of Penticton, Summerland, Osoyoos and Oliver are generously supporting this exciting event in the arts community. The exhibition will reside at Leir House Gallery from May 25 to June 21. An Opening Reception is set to take place on the evening of Friday May 25 from 7-9 pm. Everyone is invited to attend the occasion; the artists will be present, and it is an opportunity to meet them and discuss the art. This is non-juried show in the picturesque setting of Tinhorn Creek Winery in Oliver (pictured). Art, wine, and a view — what more could you ask? The Federation of Canadian Artists, South Okanagan-Similkameen Chapter proudly presents a juried art show, “For the Love of Art” at Handworks Gallery, 35648 – 97th Street in Oliver. Phone 250 498 6388. This is a juried exhibition with new works from local artists in a variety of mediums. The opening reception is scheduled Friday, July 2nd from 2pm to 4pm and the show runs from July 2nd to July 31, 2010. Gallery hours are Monday to Friday 9:30 – 5, Saturday 10 – 4 p.m. In conjunction with the opening, we will be offering two visual art demos for the public from 1 – 2 p.m. Well known local artist, Michael Jorden will begin an oil painting of the main street in Oliver. Michael will set up his easel outside of Handworks Gallery on the sidewalk , describing his process from blank canvas to finished painting. Drop by and watch this talented artist, then join the reception inside at 2 p.m. The second demo will be taking place inside Handworks Gallery. Thea Haubrich will introduce the public to Encaustic, an ancient art form using coloured beeswax and a heat source. Thea teaches Encaustic throughout B.C. and she will be happy to introduce you to this beautiful medium. Make sure you put this event on your “to do” list for July 2nd. Opening Reception Nov. 5, 1-4 (and on until 7:30 pm). Awards presented at 3 pm. An exhibition called “Small, Smaller, Smallest” will be at the Tumbleweed Gallery on Main Street, Penticton from November 5 to December 24th. Gaye Adams, SFCA, Ken Gillespie, SFCA and Karel Doruyter, AFCA juried this exhibition. Of the works submitted to the adjudicators, 14 paintings were accepted. In keeping with the theme of the show, all the works must measure less than 150 sq.inches (frame included). A variety of mediums are represented: encaustic, watercolour, acrylic and oil. The 9 artists whose works were selected for the show are (in alphabetical order): Irene Gray, Bill Hibberd, Kate Kimberley, Dale Matthews, Victoria Rodgers, Carol Munro, Jane Scheffler, Grace Shaw and Dona Smithson. An opening reception with FCA artists in attendance is scheduled for November 5, from 1 – 4 p.m. Awards from the Federation of Canadian Artists will be presented at 3:00. In addition, the reception will continue on with Tumbleweed artists present until 7:30, to welcome those who come after work. Everyone is invited to drop by! At “Small, Smaller, Smallest” you might just find the perfect ‘little’ something to put under someone’s Christmas tree. The Federation of Canadian Artists was formed in 1940 as a support and advocacy group for Canadian Artists and presently has over 2000 members. Membership in the Federation is open to professional and aspiring artists. The local chapter began in 2000 and is comprised of 2 senior professional “Signature” (AFCA) members, 47 “Active” members (who have earned this status by presenting a body of work to the FCA for assessment); and 28 “Supporting” members (emerging artists and those interested in supporting the arts). Our chapter meets monthly and welcomes new members. Or contact Kate Kimberley, Chair – 250 492 4481.